By the time we got to Scone, some 475 ks from Crookwell and our last assignment, we were getting tired, the brakes were making an expensive noise and we just wanted somewhere to camp for the night. 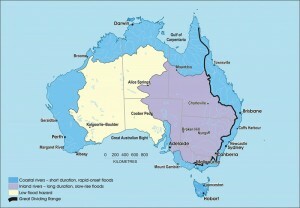 We decided on Glenbawn Dam, or Lake Glenbawn if you prefer. It’s the second time we paid for camping and although we didn’t get much at the first one, we only paid a couple of dollars. This time the cost was $18 for access to hot showers so it was probably reasonable but we were not persuaded it was better than free camping, especially when you have your own hot shower. It was one of those ‘yeah, it was alright’ places, an impoundment that works for fishing and general recreation but won’t take too many prizes for ‘most beautiful’. For a longer stay and some fishing it would probably have been good but we were only there to sleep so in terms of bang for buck, not too exciting for us. This promised to be interesting as we had to get down off the mountains (and I thought you only got down off a duck) if we were to make it to Ballina. Our brakes were now making some very unpleasant noises and for the next 240 kilometres I was using the hand brake in preference to the foot pedal. Next stop was fuel at Tamworth before a short run to Armidale which was also our very first house sitting assignment a few months before this in July. From Armidale it was going to be a 195 kilometre ‘grit your teeth and hang on’ ride as we trundled down the range with the trailer doing its best to get there ahead of schedule. Most of the road is not especially steep, although ‘steep’ is more subjective term when you have limitations. Without wanting to make too much of it, by taking it slowly, low gears, judicious use of the hand brake, the occasional ‘desperation’ stab at the grinding foot brake and a good deal of experience, Julie was able to re-open her eyes about two hours later. We did a quick fuel top-up in Grafton and got moving quickly to try to make Ballina before dark but we had our lights on for the last half-hour or so. The next morning, first order of business, I ordered new brake pads and new rotors which had to come from Brisbane. I spent the rest of the day dismantling and late in the afternoon, Rick, Paul’s son who lives across the road and who is a motor mechanic showed me how to check, change and repack wheel bearings. 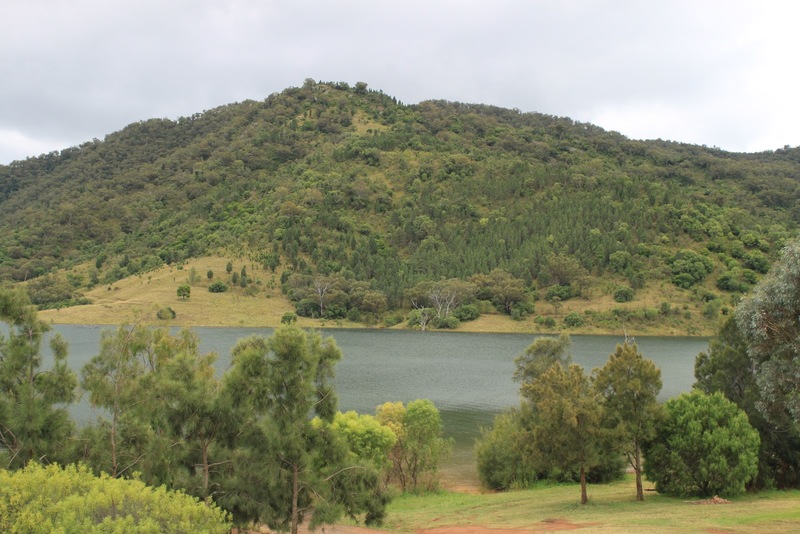 On Thursday morning we left Ipswich and arrived back on top of the Great Dividing Range to complete our 1300 kilometre trip in time for morning coffee. 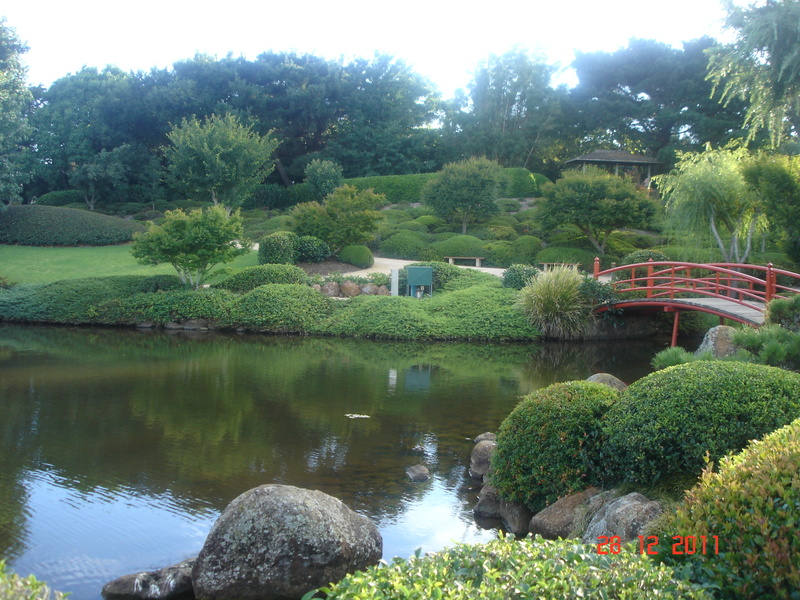 We had been looking forward to Toowoomba, which incidentally is the largest inland city in Australia, partly because a few years ago we visited the city’s Japanese Gardens, part of the University of Southern Queensland. It was stunning and we wanted to see it again. 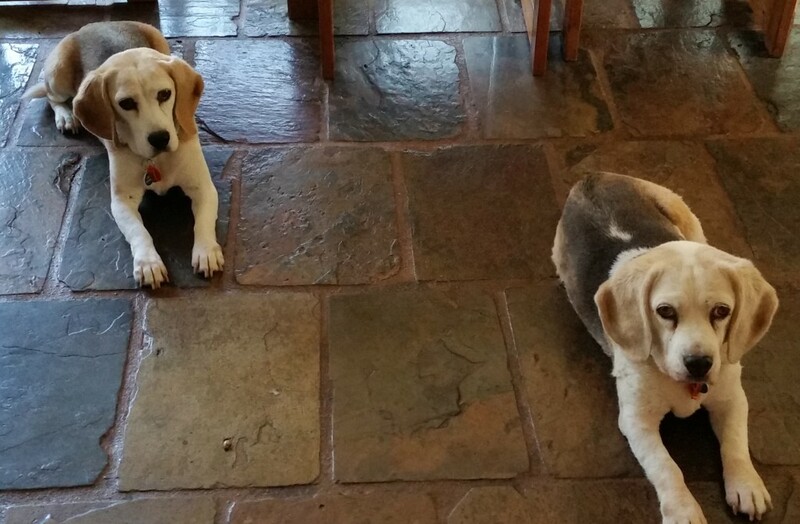 David and Nancy, who are a retired business couple and keen golfers, had some months earlier, contacted us to look after their two beagles while they were on holidays. 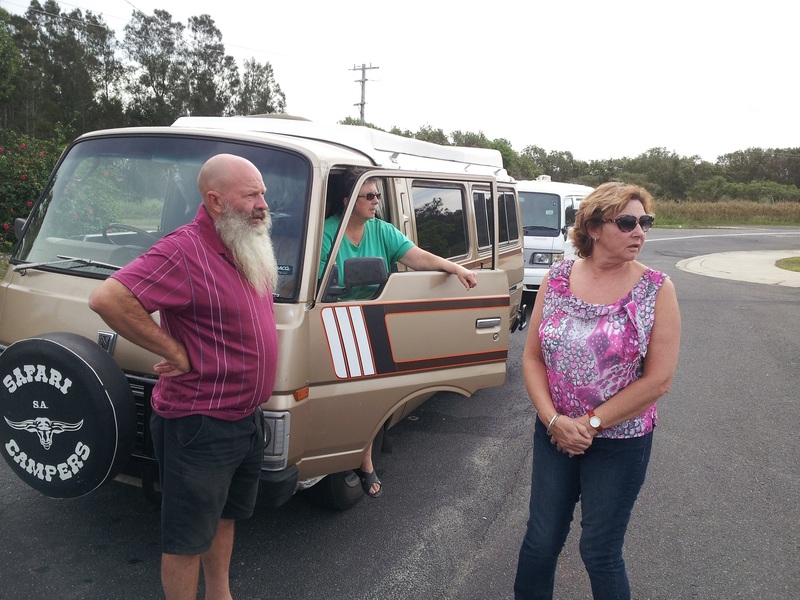 Nancy had already gone on ahead to Brisbane on business when we arrived so it was David, who was in corporate sales management before retirement, showed us the ropes. He too, left around lunch time and we settled down for the rest of the day. Late that night we both became violently ill, presumably with a particularly contagious bug which left us house-bound and to some extent bed-bound until the middle of the next week. We could barely tolerate any food whatsoever and we took mostly water for five days. It really got our attention. I had been thinking a lot about blogging as a way of lifting the profile of the yet-to-be-named site and came up with a plan to have three blogs. One of those you are reading now, Danzblog which, as you know, covers light subjects like house sitting. A second blog is to be devoted to serious subjects, like immigration, religion, politics, where I have an opinion and would like to make a contribution to the debates on these matters. The third blog, where my opinion counts for nothing, where only facts are important, the ‘still-looking for a name’ science blog. I was not to know that eventually I would roll all three back into danzblog.com. Even during the recovery we tried to follow the house routine, but it was a cheek-clenching dash a couple of times. Routine is important so that animals have the least disruption to their lives. Happy pets make for a happy house sitting experience for all. After the walk and breakfast, I’d have the rest of the day to work on the science project, at least until my eyes glazed over. The result was Danzblog.com and Just-the-facts-ma’am.com. Easy to say, not so easy to create but achievable on a steep learning curve in 30 hours each. We were fortunate that home was so comfortable. 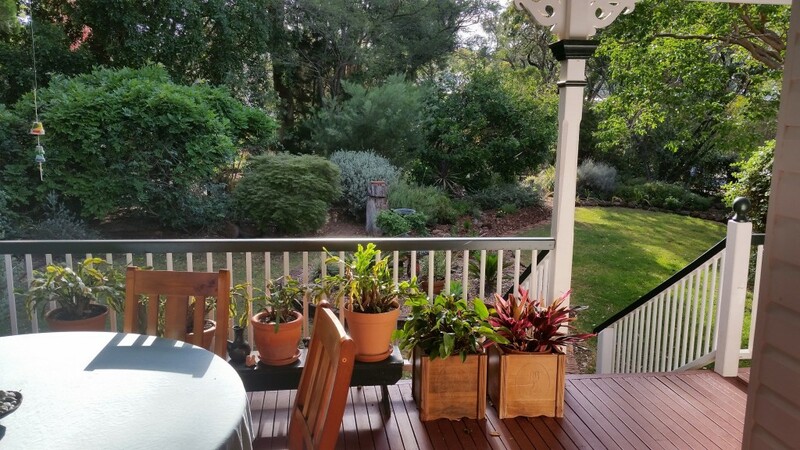 It was quiet and had a large rear deck overlooking a beautiful garden. It was the ideal place to recover from our illness and settle in to some serious mental gymnastics. Once the web sites were set up, the first articles could be published and I figured I’d need to do a couple on each site to make them ‘alive’ and work out the finer points of Google search and ratings later. Part of the dogs’ routine was getting a bone to chew on a couple of times a week. We were puzzled to see Bonnie hanging onto the bone for hours, never letting it drop. Upon investigation we found it was stuck fast onto one or more teeth and simply pulling it out was a risk too far for us. It was late in the day but we got to the vet in time and had it removed, Katie waiting patiently at home to greet us on our victorious return. Walking is not only good for one’s health and mentally therapeutic, for me at least, it is sometimes creative too. Near the middle of second week, while walking the dogs together, the ‘Diary Of The Universe’ came to me and knew immediately I’d found the name I had been looking for. Unfortunately the ‘the’ part of the name had already been taken so I had to settle for www.diaryofuniverse.com with the ‘the’ part missing, but close enough for what I needed. 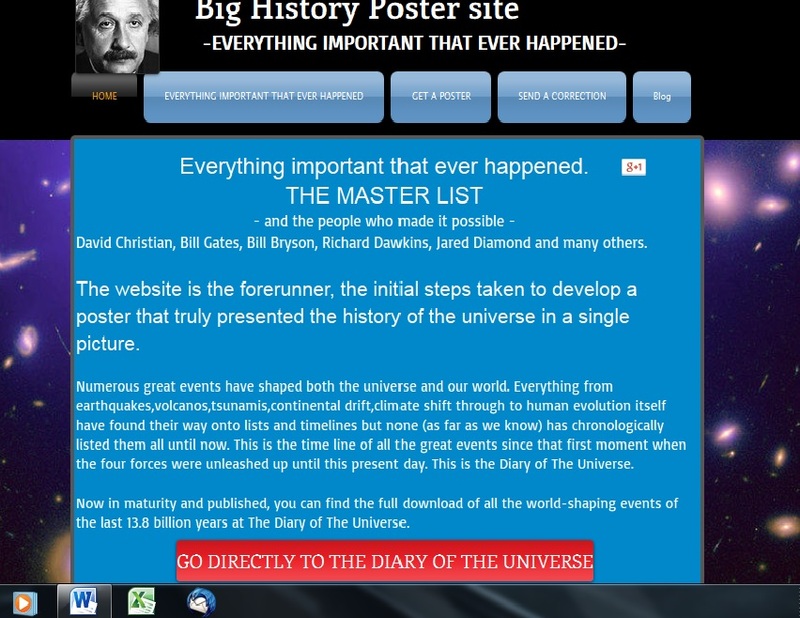 The rest of the week was spent building a new web site based on the work I had already done on the Big History Poster site which by default became demoted to a landing page referral centre for the working title. 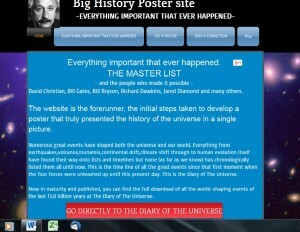 Later the ‘diary’ website would meet the same fate, morphing into an Earth History site. This idea has now developed into writing a full 1,000 word essay on each entry. Anyone will be able to access these articles but those who have a copy of the chart will be able to find a particular subject by just referring to the article number on the poster. By any standard this is a significant task which I believe will take years to complete and the final result will be 300-400,000 words or a couple of novels worth. All this pulling a trailer around the country had an effect on the clutch apparently. 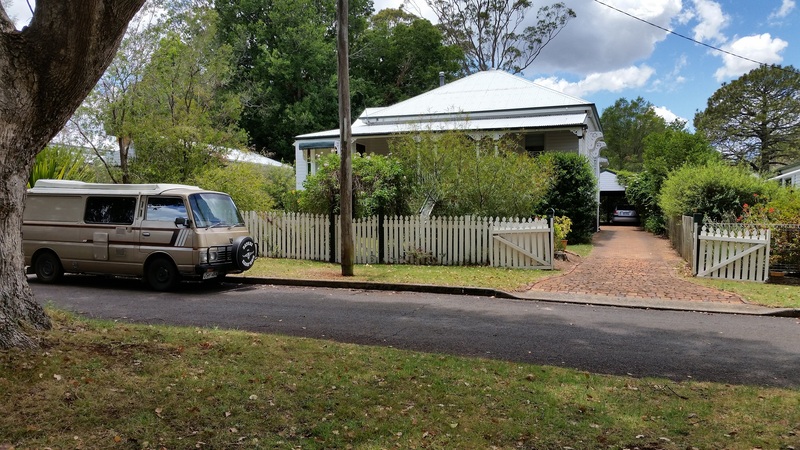 Driving around Toowoomba, we started to notice it was slipping, even though we left the trailer in Ipswich for the two weeks we would be staying in Toowoomba. It seemed wise to limit our use of the van and with all that had happened and the short stay, we never did get back to see the Japanese Gardens. It seemed no time at all that Nancy and David were back, which of course was the only time we actually got to meet Nancy in person. They were very supportive about our little vet problem and David was kind enough to gift us one of his best bottles of wine. With all the little dramas and for me at least, important decisions made and matters learned, Toowoomba will go down as one of the important assignments. We had a couple of weeks break from house sitting after this to reach Grafton where Chike and Bridget were expecting us while they went overseas for the Christmas break. 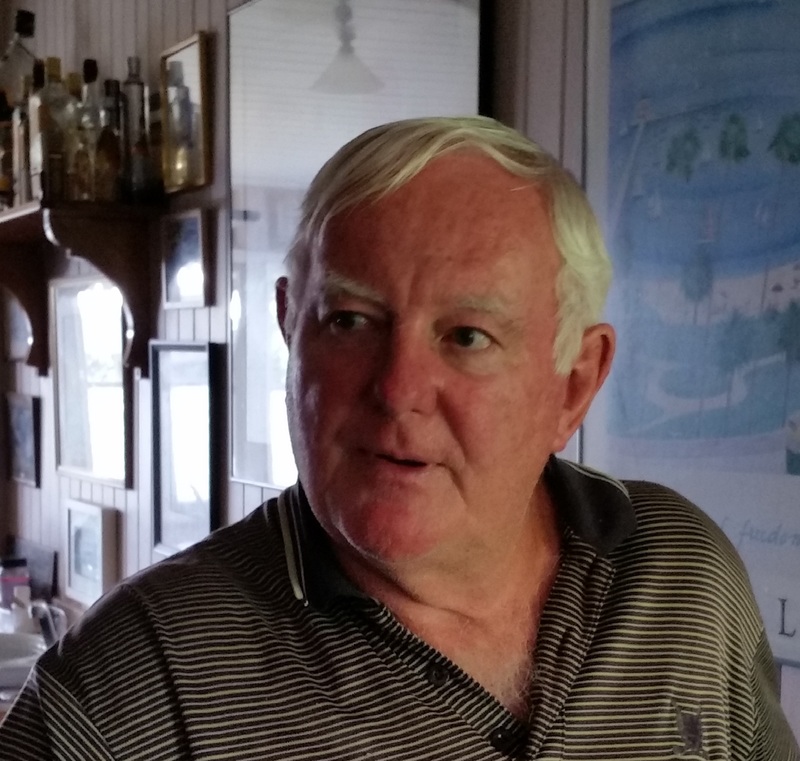 Along the way, we would be calling in to Ballina again, so I hoped I could nurse the van’s clutch that far, to where we had a large concreted area and a week or so to work on fitting a new clutch in the same spot where I replaced the brakes. Unfortunately that was not to be, as you will see. Fancy a night stuck on the side of a mountain with no way of moving your vehicle and trailer?